So, you know that you need one — but which one? That’s where we come in. We’ve put together an illuminating list of the best bedside lamp options to prompt you to that lightbulb moment. Dedicated followers of fashion are sure to love our picks which give a nod to cosy copper and achingly cool industrial, two of the biggest interior trends of the year; and those in the market for something a little quirky have oodles to choose from, from portable mood-lighting you control with your voice to origami animals to inspire wonder and whimsy. This is the best choice for a modern statement lamp. It is available in two colourways, trend-led copper or classic chrome, and looks utterly dazzling in both. The distinctive cutout design is offset by faceted glass beads on the shade’s interior, which refract the light beautifully, casting intricate patterns when switched on. It’s also fitted with a 3-stage touch dimmer, so you can select the perfect amount of light. The petite Lyss lamp is the best for creating the perfect mood: choose from frosted white glass, which emits a warm, cheery glow suitable for any room of the house, and opulent smoked glass, for a deeper, moodier light perfect for snug sitting rooms and boudoirs. Whichever finish you choose, this lamp’s gentle curves and clean, simple design look fantastic, and its premium glass construction feels especially opulent for the pocket-friendly price. You could be forgiven for thinking that the most functionality you could expect from your bedside lamp would be turning on and off — not so. 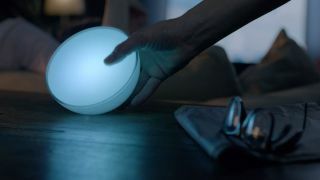 The wireless Philips Hue Go is the best lamp for gadget lovers, bar none. It’s compatible with devices utilising Amazon’s Alexa, meaning you can control the colour and brightness with your voice, and with all smart devices. It’s also portable, dimmable, and can turn up to 16 million colours and tones from warm to cold. Mind-boggling. Animation aficionados will recognise this as the original Pixar lamp, but its cult status was secured long before that. Still working off Sir Kenneth Grange’s original, timeless design, the Anglepoise Type 75 will look at home in rooms both retro and ultra-modern. The man himself called it “a minor miracle of balance”, we call it a classic. Its sleek good looks and robust-but-moveable construction are sure to make it a favourite for many more decades. These adorable Origami Woodland Night Lights bring cutting-edge modern design and folksy charm together in one sweet and stylish package — think Blade Runner meets Beatrix Potter, and surprisingly, you’re not far off. Available in a choice of bear, rabbit or fox, this is a sure bet for children with a love of all creatures great and small. Plus, the warm glow enabled by the beautiful, semi-opaque finish of the matte plastic is sure to make them feel cosy and comforted all night long. This lamp’s stripped-back, bare bulb design wouldn’t look out of place in a mad scientist’s lab, a high recommendation indeed when it comes to industrial-inspired design. The interiors world’s love affair with the trend is showing no signs of being broken off, and when the product is as beautiful as this chic walnut and brass touch lamp, we’re understandably thankful. The Alfis USB lamp gives you the pre-sleep solution you never knew you needed: a functional USB charging port to power up your phone or tablet, leaving it within arm’s reach and eliminating the need for extensions under the bed. The combination of wood and canvas is minimal and elegant, especially for a budget buy, as is the neat little on/off switch at the base. The original Lava Lamp is back, and just as good as when it was first launched back in 1963. The bespoke halogen bulb directs heat and light into the funky lava and away from the aluminium base, keeping it cool to the touch. Great for kids and big kids alike, the original ad calls the Astro lamp “the perfect gift for one’s relatives, one’s friends - and, dash it all, oneself” — we couldn’t have put it better ourselves.